We took our first outing on Friday to Toys R Us to get Ella’s first haircut. My mom was with us so I wasn’t totally crazy going out alone with 3 kids. Asher did okay. I had to feed him and then he had a poop explosion where I went through 3 diapers and 50 wipes in one change. It took about 15 minutes to clean him so that was fun. 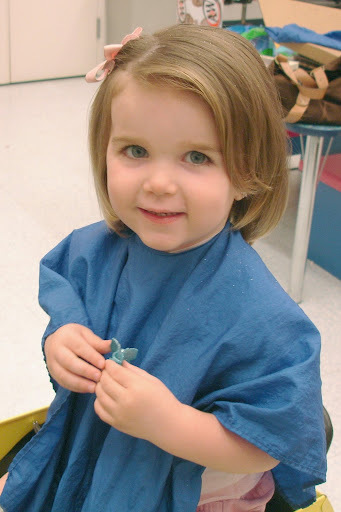 Ella sure looked cute after her haircut and is such a little girl now. Where has our toddler gone? I would love to use this photo of Ella on an advert for children’s haircuts that will appear in a kids magazine called Raring2Go. Could you please grant me permission it will have a 17,000 distribution to schools and libraries in Sunderland.